In this episode of The Engineering Commons, we discuss an electromechanical component commonly used to achieve physical motion; the ubiquitous direct-current (DC) motor. Carmen admits to getting turned on by electricity… and sugar! Although differences between engines and motors can be argued, at least one definition claims that an engine converts chemical energy to mechanical energy, while a motor converts electrical energy to mechanical energy. DC motors are powered with direct current, while AC motors are powered with an alternating current. Carmen mentions an app note (pdf) on Brushless DC motors by MPS (Monolithic Power Systems). Although linear motors will not be covered in this episode, their operation is similar to that of rotational motors. The two major categories for DC motors are brushed and brushless; the two major categories for AC motors are synchronous and induction (asynchronous). When describing a motor’s mechanical components, the portion that rotates is the rotor, while the portion that remains stationary is the stator. Brian notes that Nikola Tesla’s induction motor may be his most significant invention. In induction motors, slip is percentage difference between the rotational speed of the magnetic field and that of the rotating shaft. A homopolar motor was developed by Michael Faraday in 1821. Joseph Henry created an electo-magnetic “rocker” in 1831. 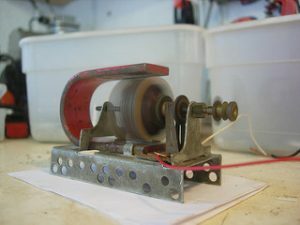 In 1832, William Sturgeon produced the first practical DC motor. An H-bridge is an electronic circuit that allows a DC motor to run forwards or backwards. In many cases, a pulse-width modulation (PWM) signal can be used to control motor speed. This is accomplished by turning motor power on and off at a high frequency, while maintaining a desired ratio of “on” time to “off” time. When describing a motor’s electrical components, the portion that carries the current is called the armature, while the portion that generates the magnetic flux is called the field. An electrical charge passing through a magnetic field is subject to a mechanical force, known as a Lorentz force. A conductor (wire) carrying current through a magnetic field can thus be levitated by this force. DC motor behavior is described by several motor constants, including the torque constant and the back-EMF constant. A commutator periodically reverse the flow of current through an external circuit. In a brushed DC motor, this is accomplished mechanically. Brushes deliver voltage to the commutator, and are often spring loaded against the commutator segments. In mechanical systems, rotational power is the product of torque and angular velocity. Brushless DC motors often use Hall effect sensors to detect when power should be switched to a different armature winding. A stepper motor advances by a fixed rotational angle each time it receives an input pulse. Enterprising engineers can play music with stepper motors! Thanks to Les Chatfield for use of the photo titled “At speed!” Opening music by John Trimble, and concluding theme by Paul Stevenson.